It is well known I am a supporter of everyone being who they truly are and helping find what that is and resolving what appears to hinder their experiencing of True Self. I Know in my Heart that each of us experience what is necessary to bring self into alignment with Self and Truth, so I find myself naturally supporting others in their expressions of Being recognizing this is a part of the process of becoming One with The Truth of Self. I have noticed that for some, sometimes for many, there is a tendency to feel uncomfortable with those who appear different and judge that as wrong or abnormal, often times both. In the U.S. where I live, as with other countries, there is an inclination towards punishing and out-casting others for what we individually and by extension as a society, have concluded is defective including homosexuality and transgenderism. This reaction is in the process of changing and I am doing what I can to support the transition. I have met, been friends with and worked with lesbians, gays, bisexuals and even a transgender, and have found them to be no different from anyone else. To me, ones gender or sexual orientation does not define the person; it is merely an aspect of their expression, so after seeing and reading about all the fear around LGBT rights and equality, and defending them, I wanted to make an even larger statement. Regardless of your makeup and all that includes, you are Loved, Supported and Accepted by me and will remain so when interacting with my business in any way. 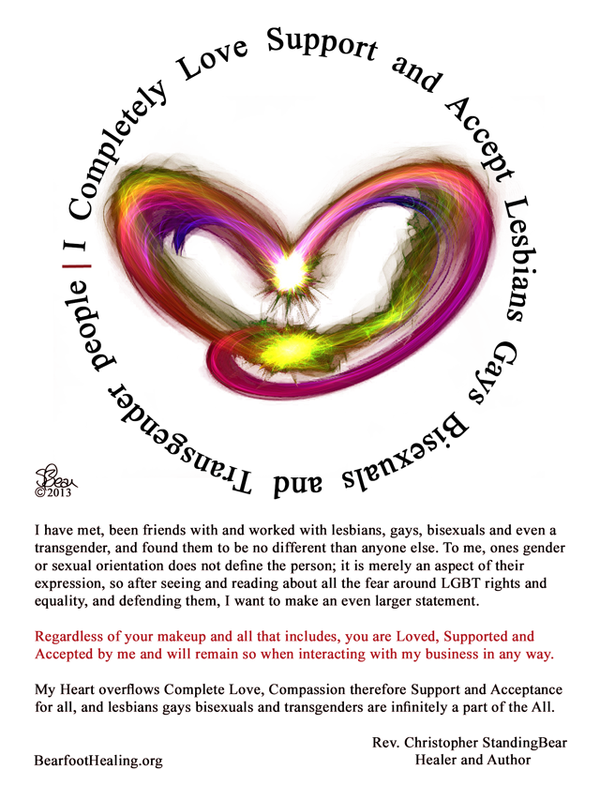 My Heart overflows Complete Love, Compassion therefore Support and Acceptance for all, and lesbians gays bisexuals and transgender are infinitely a part of the All. Because I feel this way about LGBTQ people and their community, and maybe you do too, I wanted bring a couple of petitions to your awareness. The first calls for cancellation of the rescission by U.S. President Trump of the Title IX Obama-era guidance which gives federal protections to transgender students. Many states have laws regarding discrimination including of transgender individuals. I signed this petition because I feel it is important that we as individuals and a society further our support of rights and protections from discrimination at the federal as well as state level. Retraction of any part of Title IX feels like a step backwards unless replaced with an improvement on rights and protections. The second is about a recent decision by the Motion Picture Association of America to rate “3 Generations”, a movie about a transgender teen played by Elle Fanning, R (restricted) which would make it challenging for those under 17 in the U.S. to see the film, including those who identify as transgender and feel alienated by current societal standards of norm. I signed the petition because regardless of the reason(s) for the R rating, I feel it is important that an exception be made with movie for the opportunity of deeper understanding and comfort it may bring. As I’ve said and written many times, I Know that regardless of who you are in physical form and what you have apparently done, you deserve Love. I Love You! This entry was posted in Link, My Thoughts and tagged 3 Generations movie, bisexual, gay, lesbian, LGBTQ, Love, petitions, queer, Rev. Christopher StandingBear, support rights and protections, Title IX, transgender. Bookmark the permalink.